« Pretty in Pink Final Contestant List! So if the stitch you just knit into, the stitch you’re about to knit into, and the stitch you’ll knit into after that are all white, you knit a white stitch. Continue in this manner a kabillion times. After a row of doing this, I’d picked up the rules easily and some larger patterns emerged that I’ve been able to use to simplify and speed up how I knit it. It’s been a really fun pattern. Another great property of the pattern: it’s jogless! Oh yeah, and the distribution of 0s and 1s is about the same throughout the pattern, so if you’re using only 2 colours you can buy the same amount of each and not worry about the deterministic nature of the pattern. Yay! The only thing I’m worried about is the yarn. I don’t really like how the texture is turning out and I’m worried it’s going to be scratchy. Which is really annoying, because I spent hours unravelling it from an old fair isle sweater. From the look of it, should I abandon the yarn and knit with something else? I think I’m going to try blocking what I have so far and see what that does. Any advice? Ahhh no not another binary type scarf.. well.. ok this one seems pretty cool.. in fact it’s rather very cool! Can’t wait to see more of it! I love that knitters are such math geeks. It just makes me smile! You’re smart to block and check it now! Don’t knit it all to find you’re unhappy with it! This is a great pattern! Thanks, Carol. I’ll have to check that soon; it’s off the needles for now in favour of a winter hat that I’ll be needing now that I’m back in Kingston. Martin: Rule 110 is nice too, but Rule 30 is neat because it’s so chaotic. There’s still quite a bit of predictability in Rule 110. Tammy: There have been so many times that I’ve wanted to post about the math geekiness of knitting. I have a post saved about magic numbers, maybe I should pull it out and finish it. 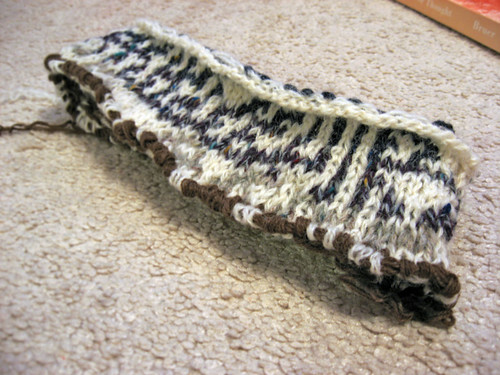 This entry was posted on January 8th, 2007 at 12:44 pm and is filed under Fair Isle, In Progress, Projects, Recycling, Rule 30, Scarves & Shawls. You can follow any responses to this entry through the RSS 2.0 feed. Both comments and pings are currently closed.